Victoria has more whale watching boats leave their harbour than any other place on Vancouver Island. The reason is three fold: One, there are more tourists here than any other Vancouver Island destination. 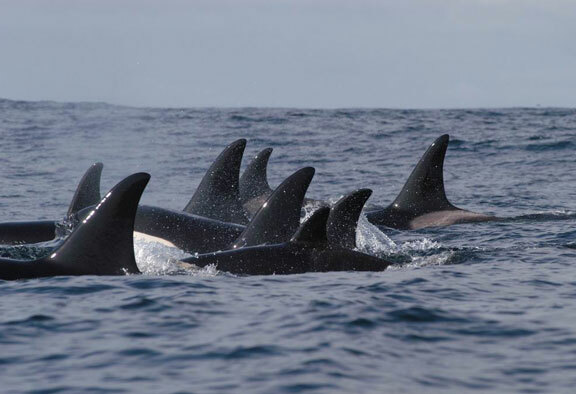 Two, the areas around Victoria are considered a great region to not only see Humpback whales but also Orcas. Three, the whales are a fairly close distance to the Victoria harbour meaning you don’t have to travel for two hours just to see them. Many Victoria whale watching companies have a few larger boats with onboard restrooms for the comfort of their guests. details, refinishing, additions and upgrades were ongoing right up until 1915. Francis Rattenbury and his crew made an effort to use local materials, resources and expertise when building the Parliament Buildings, as during this time in B.C.It was important to both him and the government to support local businesses. Granite rock foundations were brought in from nearby Nelson Island, the site facades were locally imported from Haddington Island, and most of the local brick, lime and Douglas Fir were accumulated from areas around Vancouver Island. The inside of the buildings are just as grand as the outside, which features a statue of Queen Victoria on the front lawn. You can book tours of the buildings that will give you both insight and perspective on the historical significance of Victoria as the command center for British Columbia. The Parliament Buildings are also worth a visit at night-time, as the 3,300+ light bulbs that adorn the façade are lit up, casting a magical glow over the harbour. 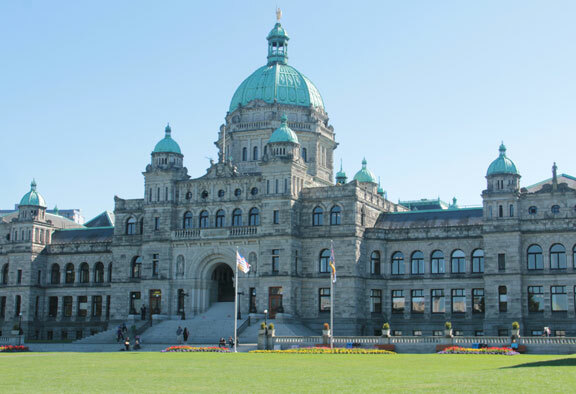 The political governing body – elected by British Columbians – assembles in this house to pass law and make decisions affecting the future direction of the province. 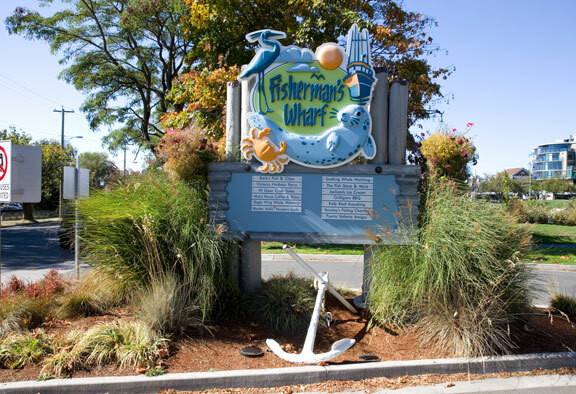 Some of the nearby attractions include Beacon Hill Park, the history of the BC Royal Museum and the shops, boutiques and artisans in the downtown core on Government Street. 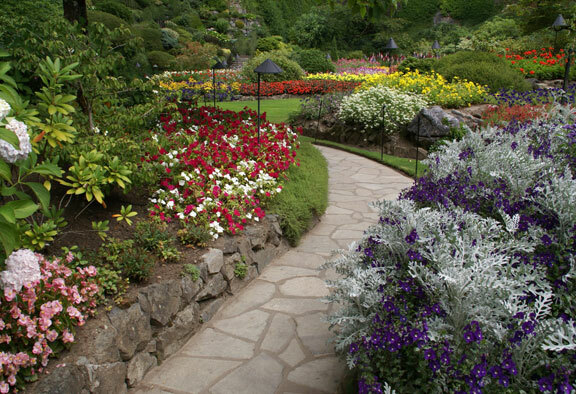 Starting in the early 1900’s, Butchart Gardens have only become more magnificent with time. The Gardens began as a modest limestone quarry dating back to the early 1900s. Over time the quarry was transformed into one Canada’s premier garden attractions. The floral gardens are the brainchild of a cement contractor by the name of Robert Pim Butchart. Robert and his wife, Jennie Butchart , moved west to Victoria, BC on Vancouver Island from Ontario, Canada. The Butchart family has been responsible for carrying on the legacy of these now famous gardens. Jennie Butchart recognized that the mild temperatures and the lush environment was an ideal setting for gardening. Slowly the gardens grew and the Butchart Gardens were born. The Butcharts received many accolades. Robert Butchart was given the key to the city and was made a Freeman of the city of Victoria in 1928. Jennie Butchart was named Citizen of the Year in 1931. After the death of Jennie Butchart, the gardens fell into despair. The grounds were left unattended and it became a wilderness garden up until 1946. It was then that Ian Ross, the grandson of Jennie Butchart and his wife, Ann Lee Ross, resurrected the Butchart Gardens. In order to help with the costs, they began charging admission and generating revenue from their Seed and Gift Store, as well as the Benvenuto Tea House. Today the gardens are open year round and you can see hundreds of different colors and varieties of flowers. The rose collection of the garden is considered one of the best in the world with each breed marked with the country of origin. Overall there are 117 varieties of tea rose plants, 64 types of floribundas, and 400 grandiflora roses planted on the 55 acres that make up the Butchart Gardens. Further to roses – the rhododendrons are a dominating sight in the early spring, the assortment of perennials are a highlight throughout most of the year and the Japanese, Mediterranean and Italian Gardens are major attractions during the fall. Closer to the holiday season, the Butchart Gardens are decorated with Christmas lights accompanied by carollers and a brass band, bringing joy to the world. You will see license plates from all over North America as people come to check out these spectacular gardens unique to Victoria. Water fountains, lights and night-time fireworks help add to the grandeur of the place visited by nearly a million people every year. gardens with seasonal flowers, rhododendrons and well-manicured Japanese trees. There are many places to make a pit stop for a walk along the pathway located on the ocean side of the road. Because the walkway is exposed to the coastal elements, it is always wise to prepare for strong winds as well as sunshine, as there are stretches of the pathway that provide very little shade. There are areas with sightseeing benches and access to stairs leading down to the rocky and sandy coastline. Some of the marine sightseeing includes cruise ships, sail boats and yachts cruising on by. During the winter months the pathway also serves as a lookout point for watching storms and crashing waves. Sections of angle parking are convenient for winter weather and rainy days, as one can watch the storms from their vehicle. 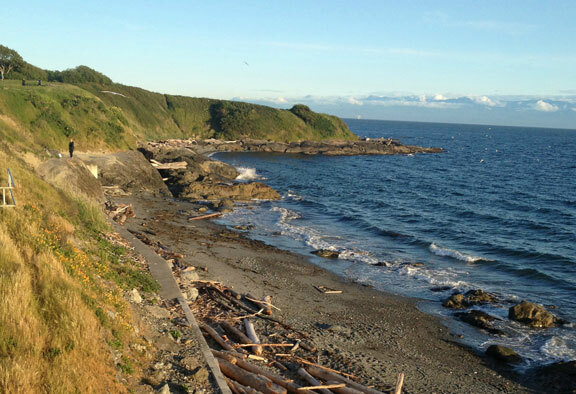 The Dallas Road waterfront connects to Beacon Hill Park and continues along sidewalks and side streets to an area of Victoria called Oak Bay, which boasts some lovely sandy beaches. 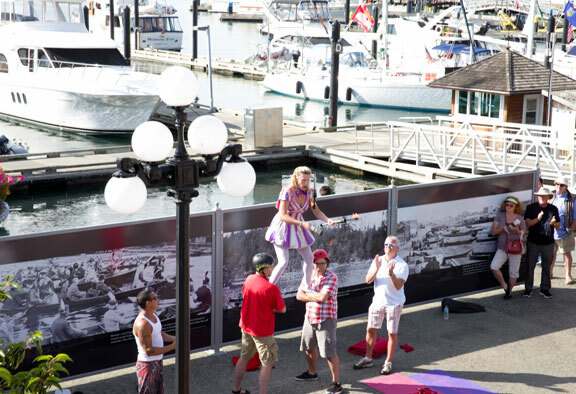 While exploring along the waterfront there are often opportunities to view marine and sporting activities. Some of the activities enjoyed on the waterfront ocean playground include kite surfing, kayaking, scuba diving and kite flying. Chinook salmon and usually see them in the 12-30 lb range. 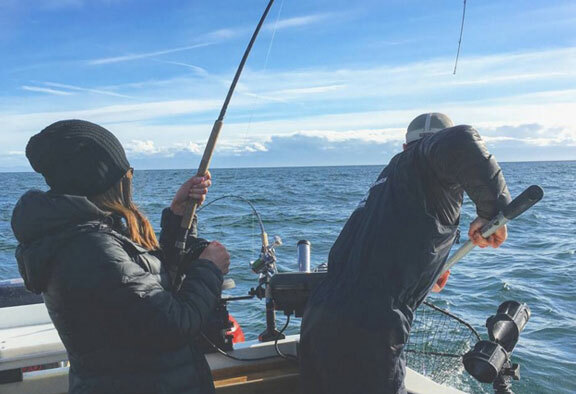 From May to September the best fishing happens in Sooke, Port Renfrew or Ucluelet. Check out Discover Vancouver Island Tours for charters around Victoria and Port Renfrew and Salmon Eye Charters for trips in Ucluelet, BC. 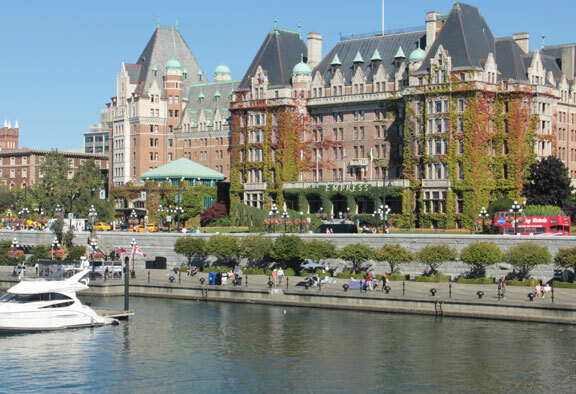 The symbol of Victoria since its opening in 1908, the Empress Hotel has hosted Kings, Queens and Hollywood stars from around the world. The Chateau-style hotel is famous for its afternoon tea, crystal ballroom, and since 2002, the addition of the Willow Stream Spa. The Bengal lounge, one of its four restaurants, is themed to reflect Queen Victoria’s trip to India. Rudyard Kipling was a frequent guest and may have also had an influence on this room. Over the past 20 years, millions of dollars in renovations have gone into the building in order to update the hotel. It has been recognized as one of Travel and Leisure’s best hotels in the world, and held a spot on the Conde Nast Gold list. history specimens, and archival records. The many collections are divided into eight disciplines: Mammals, Invertebrate Zoology, Palaeontology, Entomology, Botany, Ichthyology, Ornithology and Herpetology. The museum has hosted touring exhibits including Leonardo da Vinci, artifacts related to the RMS Titanic, Genghis Khan and Egyptian artifacts. The Royal British Columbia Museum First Nations Gallery is a world class exhibit with interactive displays, artifacts and a long house. A favourite is the First Nations ceremonial masks, which come from the Kwakwaka’wakw era. The Crooked Peak of Heaven and Supernatural Raven masks were said to be constructed in honour of the late Chief Kwakwabalasami of Fort Rupert. The Modern Era History Gallery delves into the history of the arrival of the European and Chinese settlers. The HMS Discover, captained by George Vancouver, is on display. He arrived in Nootka Sound on Vancouver Island and was one of the first Europeans to meet with the First Nation people. The Modern Era History Gallery explores the mining and logging era on the west coast, highlighting the days of the gold mines and logging camps. The tools and the technology to work their trade are on display. The Natural History Gallery explores the environment and the changes of the natural scenery in BC over the years through the eyes of our forests and wildlife. Guarding the gallery entrance is a massive Woolly Mammoth, while a Grizzly Bear hunts for food in one of the three-dimensional forest dioramas. 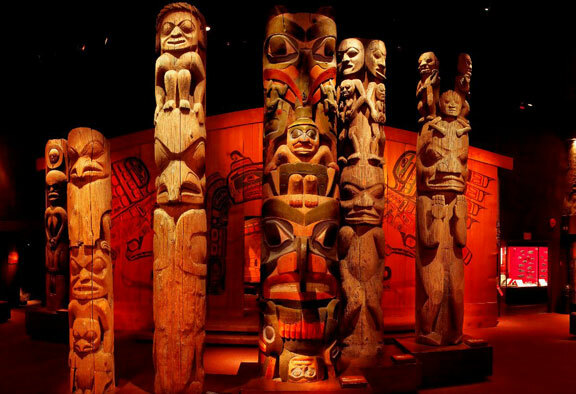 The Royal British Columbia Museum is a great educational tour to discover and understand the past of our people, forests, oceans, wildlife and communities. The exhibits are world class and the location is central. It is a great place for families to spend some quality time together learning, looking and listening. Tours are available and there is a price for admission at the door. history of the beautiful capital of British Columbia. 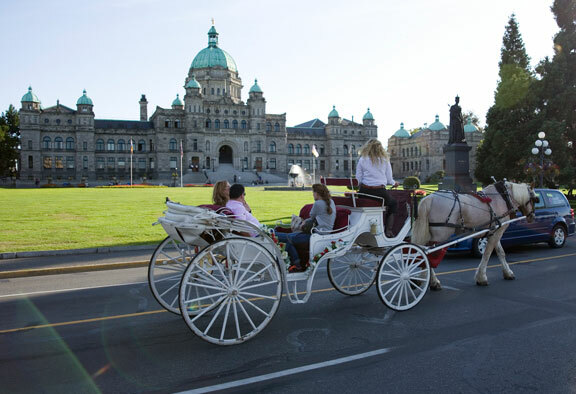 Check out our City Tour and Accommodation Bundles for Victoria B.C.! a car and a passenger ferry, as well as many other boats. 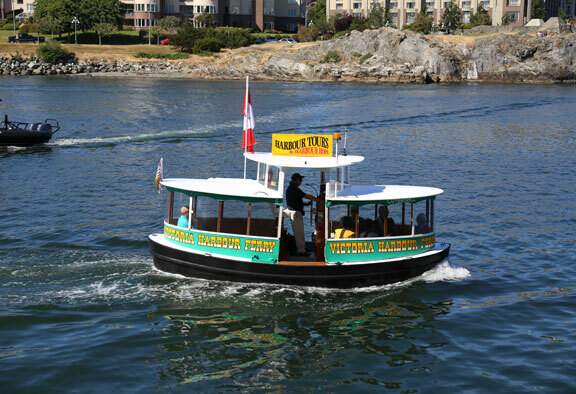 Water taxis cruise between the downtown harbour and Esquimalt. Chinook salmon. During the tourist season this point can get very busy and it is a place in Victoria where you can see a combination of locals and international visitors. and you will probably end up taking quite a few photos of this unique dock. During the summer months this place can get very busy, so make sure you get parking early in the day if possible. (61’ or 18.59) and is 85’ (25.9m) wide. Crystal clear images and wraparound digital surround sound give you a cinematic experience so powerful you may just think you are watching it in real life! 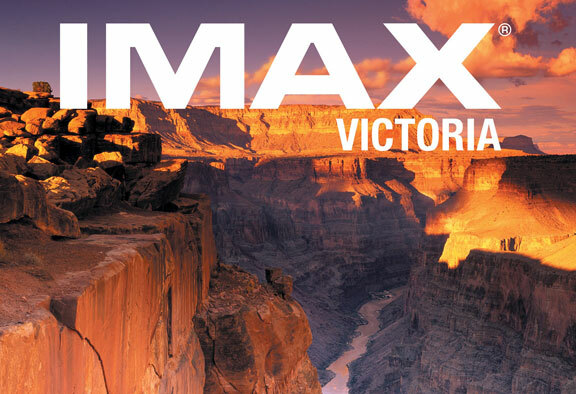 Many of the films featured at the IMAX Theatre are big budget adventures, biopics and documentaries from around the world. The theatre’s west coast location creates a focus on wilderness, wildlife and outdoor adventure-type films. With up to 5 different productions playing at a time to choose from, it is best to call ahead to see what is being shown in advance. fleets of the British Royal Navy’s Pacific Squadron. For many years, a lighthouse keeper maintained the lighthouse until it was automated in 1929. 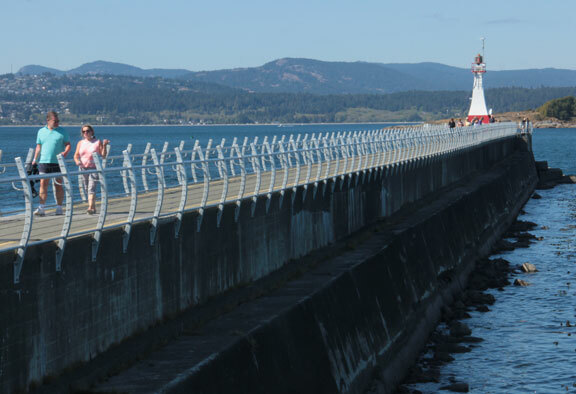 The Fisgard Lighthouse is a sightseeing destination providing views of the Olympic Mountains and the Pacific Ocean. There are often marine sightings as well including sailboats, yachts, cargo ships and navy vessels. The historic landmark also operates as a museum with exhibits detailing the stories of lost ships, the life of a lighthouse keeper and the battles won and lost fighting west coast storms, as well as a birding and wildlife destination. The unique location provides opportunities for birders to capture sightings of blue herons and bald eagles and for photographers to capture photos of sea lions, seals and whales. 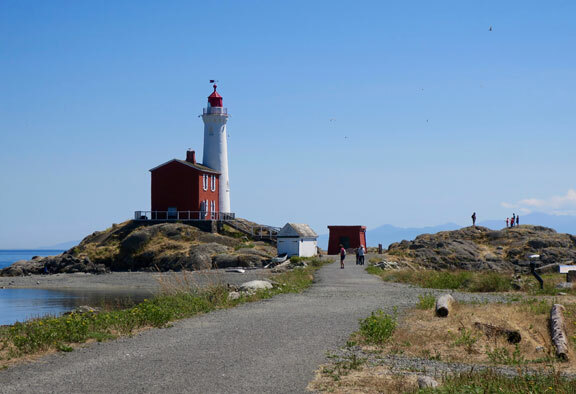 To accommodate your visit to the Fisgard Lighthouse there is a day use picnic area. The Fisgard Lighthouse is about 15 kilometres from downtown Victoria, BC, located at 603 Fort Rodd Hill Road – just off of Ocean Blvd. 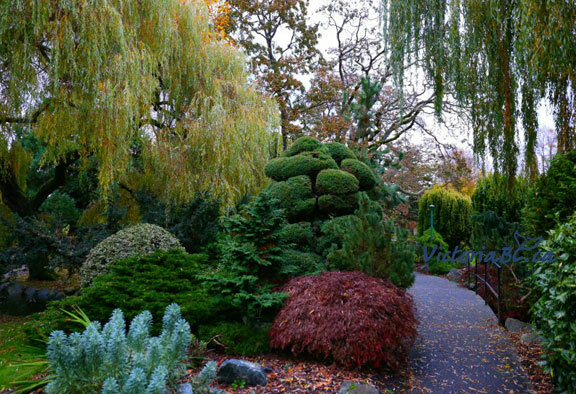 The Beacon Hill Park is a park is popular both with locals and tourists. The 75 ha (200 acre) park contains many ponds and landscaped gardens, woodland and shoreline trails, a waterpark, two playgrounds, a petting zoo, and tennis courts. Flocks of ducks reside in the ponds and you can also see many other types of birds. Racoons, river otters and squirrels can be seen among the Garry oak, Douglas-fir, western red cedar, arbutus, snowberry, Oregon grape, and fawn lily trees. Although set aside in 1858, the land only officially became a park in 1882 and was originally a burial ground for the First Nations people many years ago. has restaurants with outdoor seating and small shops. On the other end are the Parliament buildings, IMAX theatre, Royal BC Museum and Aquarium. Whale watching boats and water taxis can be seen docking and leaving regularly. All of this is a backdrop for the numerous street performers and artists set up along the walkway making it a one of a kind place you have to experience, especially during the tourist season. of the castle, also died before its completion. The Craigdarroch Castle has 39 rooms and over 2,300 square meters (25,000 square feet). 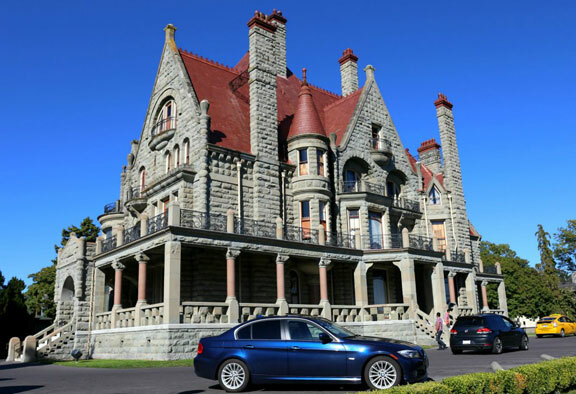 The cost for the Craigdarroch Castle is believed to have been as much as $500,000 by its completion, an astronomical price for the time and Victoria’s most expensive residence of that era. Features of the building include granite from British Columbia, an oak staircase prefabricated in Chicago, 30+ stain glass windows, the 1890s furnishings, white oak & mahogany woodwork and the floor tiles, which were shipped in from the city of San Francisco. In 1979 the castle became a popular tourist attraction and museum receiving over 150,000+ visitors a year. The attraction is open to the public and individuals are encouraged to enjoy self-guided tours at their leisure and explore the mansion and grounds. Throughout the castle are numerous historical artifacts. Some of the highlights include a Sir John A. MacDonald engraving, a Schafer painting, a Parian Ware statue, the Garden Entrance Chinese Vase, a Steinway Baby Grand Piano, paintings, a thimble collection, James Dunsmuir’s Seal and a Bust of Prince Albert of Saxe-Coburg and Gotha. The castle is located at 1050 Joan Crescent, Victoria, British Columbia, Canada and is currently managed by the Craigdarroch Castle Historical Museum Society. and paintings, many of which depicted the lives of the First Nations people of Canada. The most famous of her writings was her book Klee Wyck, which told the story of the lives of the First Nation people. Klee Wyck later won her the Governor General’s Gold Medal for literature. Some of her other published books include The House of all Sorts, The Book of Small, Hundreds and Thousands, Growing Paris, The Heart of the Peacock, Wild Flowers and Unsettling Encounters. Emily Carr was most recognized for her impressionist paintings. Her best known works include the Big Raven, Guyasdoms d’Sonoqua, Indian Church, Totem Walk at Sitka, Zunoqua of the Cat Village, Red Cedar, The Mountain, Tree Trunk, and the Rushing Sea of Undergrowth. Today, the Emily Carr House is an interpretive centre providing insight into the life and art works of the famous Canadian artist. The home is open for viewing, often plays host to different art showings, events and exhibitions, and is a popular attraction in the area. There is a gift shop on site with many of her books and reproductive prints available for purchase. 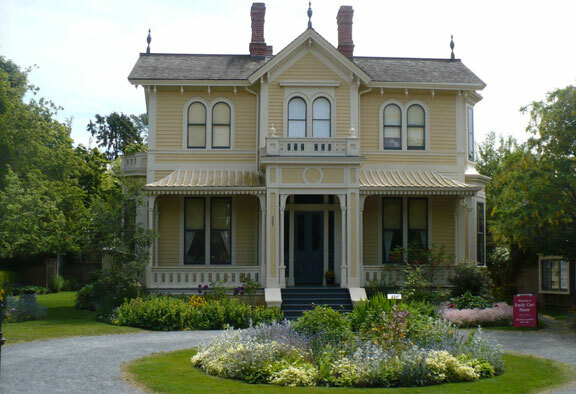 The Emily Carr House is located at 207 Government Street and is open to the public during the summer season.